"We footballers belonging to the various clubs in the Paris region have today decided to occupy the headquarters of the French Football Federation. Just like the workers are occupying their factories, and the students occupying their faculties. Why? ...DEMAND THE IMMEDIATE DISMISSAL (by means of a referendum of the 600,000 footballers, controlled by themselves) of the profiteers of football and the insulters of the footballers. FREE FOOTBALL FROM THE TUTELAGE OF THE MONEY OF THE PATHETIC PRETEND-PATRONS who are at the root of the decay of football. And demand from the state the SUBSIDIES that it accords to all other sports, and which the pontiffs of the Federation have never claimed. 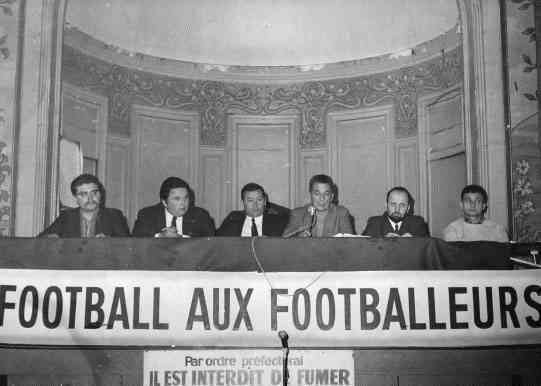 So that football may remain yours, we call on you to MAKE YOUR WAY WITHOUT DELAY to the headquarters of the Federation which has again become YOUR HOUSE, at 60 Avenue d'Iena, Paris. United, we will make football once again what it ought never to have ceased to be - the sport of joy, the sport of the world of tomorrow which all the workers have started building. EVERYONE TO 60 AVENUE D'IENA!" Enragés and Situationists in the Occupations Movement, May '68 - René Viénet (Autonomedia/Rebel Press, 1992). United, we will make football once again what it ought never to have ceased to be - the sport of joy, the sport of the world of tomorrow which all the workers have started building. EVERYONE TO 60 AVENUE D'IENA! Mad, I was just talking about this to a friend of mine the other day..
Nice one for adding this! sports and politics! something that is lacking in the US. Amid the protests of 1968, a group of journalists took French football leaders hostage.